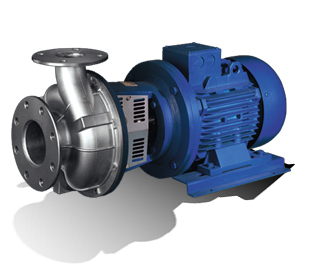 HG pumps have the same interaxis of ISO 5199 chemical norm pumps, this means easy interchangeability. Casing and impeller manufactured with investment casting technology. Standard IEC motor (different brand available) with stub shaft design. Possibility to choose seal arrangement: single, bouble tandem, double back to back and packing gland. HG pumps can handle slightly contaminated liquids or non abrasive slurries in the chemical and petrochemical industries; well suited for handling liquids with gas contents up to 10%. They are also used in general industrial service, foodstuff industry, dissolved air flotation systems, sugar industry, water/solvent recovery process, power stations, steel industry, textile and small evaporator plants. HGM - HGA: Close-Coupled with standard B5 electric motor.